No doubt a person who has achieved the rank of centenarian can look back at an amazing life. Many of us who are may be at midlife, and have read some of the fascinating research on these pages are starting to think that becoming a centenarian is not as against the odds as it once was. 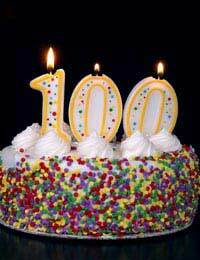 That may prompt us to wonder, “what will life be like when I reach that triple digit birthday? Before we speculate on what may lie ahead, lets take a look back, and take a glance at just some of the remarkable changes that have transpired over the lifespan of today’s centenarians. The average life expectancy was around 47. Many of the modern conveniences we take for granted, like electricity and indoor plumbing were the exception not the rule. Others like washing machines, detergent, cosmetic products and gas stoves weren’t even thought of yet. Housework was hard labor. The tallest structure in the entire world was the Eiffel Tower. Most women washed their hair only once a month and used borax or egg yolks for shampoo. In America two out of every 10 adults couldn't read or write. Only 6% of all Americans had graduated from high school. The United State reported less than 150 murders in the entire country. Antibiotics,plutonium, and insulin had yet to be discovered. There was no Scotch tape, crossword puzzles, canned beer, or iced tea. Coca-Cola was caffeine free, but it actually contained cocaine. As you can see from the above list, the changes that occurred over the last 100 years during the lifespan of a person becoming a centenarian in 2008, were not only related to technological progress. We have come a long way in many areas of culture, and the arts as well. One Jazz-man who recently celebrated his 100th, looks back at the music of his life. At 100 years of age Laurence Lucie is recognized as one of the preeminent jazz guitarists of our time. His fingers may not be as nimble on the strings as they once were, but he still can draw a crowd. He is the worlds only living person to have played with the legendary Duke Ellington, he played with Benny Carter, and Louis Armstrong, in fact he was the best man at Satchmos' wedding. On person who attended Lucie’s recent 100-year tribute celebration described him as a living history of Jazz since he has appeared on just about every significant jazz recording ever made. Lucie was born in December of 1907 and he says he started learning to play music nearly as soon as he could walk. His father was a barber and part-time jazz musician. At the tender age of 8 Lucie was already playing with in his father’s band. At 19 he moved to New York City to pursue his love for guitar, and the rest is as the say “history”. Like many centenarians Lucie says his passion and love for his work, is the secret to his longevity. He still will play out when he can, he gave his last actual concert date in 2005, and up until three years ago at the age of 97 he taught Jazz guitar at The Manhattan Community College. He also says he was only with one woman at a time, never drank whiskey, (much), and always listened to his father.